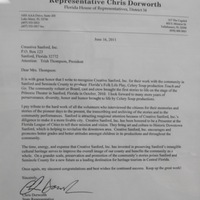 A letter from Florida House Representative Chris Dorworth recognizing and congratulating Creative Sanford, Inc. and its then-President Trish Thompson for their work preserving and presenting community history through folk-life plays, specifically Touch and Go. Creative Sanford, Inc. is a non-profit organization created to manage Celery Soup community theater productions. The original idea for the Celery Soup: Florida’s Folk Life Play project came from Jeanine Taylor, the owner of a folk-art gallery on First Street in Sanford, Florida. Their first production was Touch and Go, a play focusing on the people of Sanford and their determination to overcome various obstacles, including the Freeze of 1894-1895, the fall of Sanford's celery industry, and the closing of Naval Air Station (NAS) Sanford in the 1960s. Richard Geer and Jules Corriere, partners from Community Performance International, were in charge of assessing oral histories, converting them into scenes for the play, and writing original songs. Director Geer also used an all-volunteer cast from the local community, many of whom were not experienced actors. In the process of producing the show, Creative Sanford decided to rehabilitate an historic building, the Princess Theater, which is located on 115 West First Street and owned by Stephen Tibstra. The Creative Sanford offices are housed in the Historic Sanford Welcome Center, located at 203 East First Street. 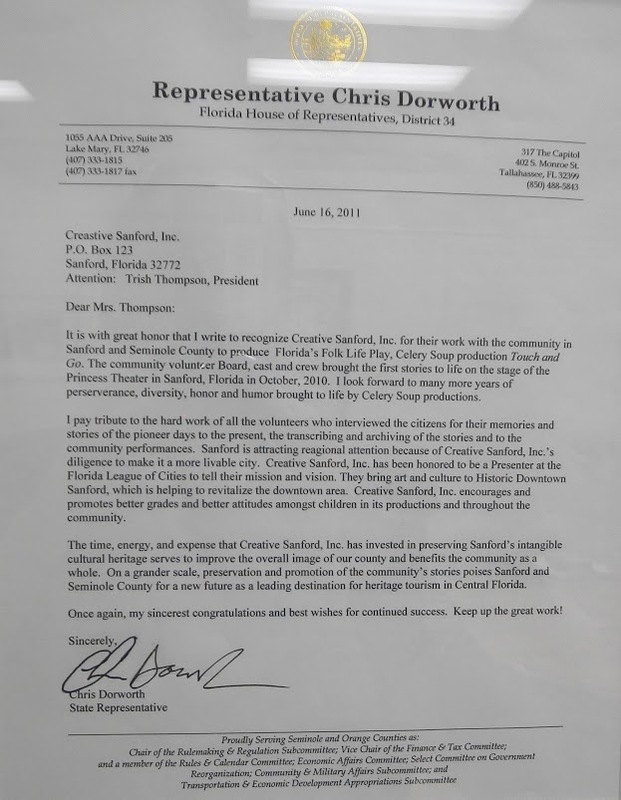 Original letter from Chris Dorworth to Trish Thompson, June 16, 2011: Creative Sanford, Inc., Historic Sanford Welcome Center, Sanford, Florida. Digital reproduction of original letter from Chris Dorworth to Trish Thompson, June 16, 2011. Originally created by Chris Dorworth and owned by Trish Thompson and Creative Sanford, Inc.
Dorwoth, Chris. “Letter from Chris Dorworth to Trish Thompson (June 16, 2011).” RICHES of Central Florida accessed April 20, 2019, https://richesmi.cah.ucf.edu/omeka/items/show/3055.